SAMABHAVA has seen and attended several emergencies till date. From incidents such as road accidents, electrocution and compound fractures in equines; we have also attended to abuse and cruelty cases by equine owners. In all these situations, we have tried our best to alleviate the animal’s suffering in every possible way. Colic is essentially, pain in the digestive tract. It is caused due to the quality and excessive quantity of food. Rapid drinking of dirty water also causes Colic. Eating strange things such as garbage, plastic; infestation of Internal Parasites and sharp teeth are also possible causes. SAMABHAVA has tended to several Colic cases since its inception. Treatment has been administered depending on the seriousness of Colic. In certain severe cases, where there is no hope for improvement, the animal has to be euthanized. Rabies is a highly zoonotic, viral disease. 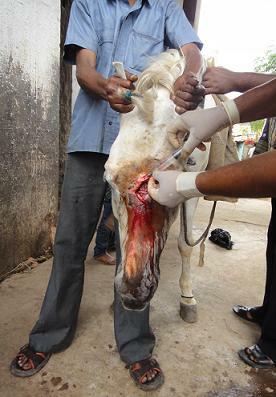 The incidence of rabies in equines compared to other animals is low but the disease is important because a rabid horse may serve as a source of infection for humans. The furious form of Rabies may cause paralysis, convulsion and even death. SAMABHAVA has treated one case of Rabies up till now. 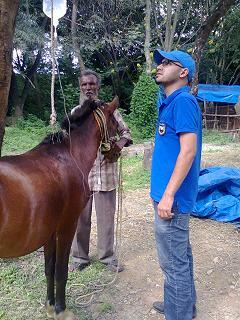 We also ensure to administer Anti-Rabies Vaccinations to as many Equines as possible. 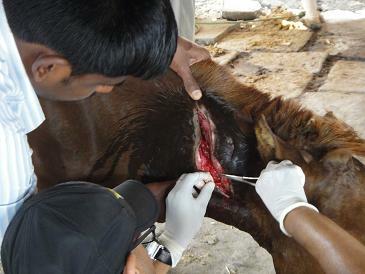 Strangles (also equine distemper) is a contagious upper respiratory tract infection of horses. The disease is very contagious and morbidity is high. Strangles cases, have most often been euthanized due to the inability to detect the disease in a timely manner. However, nine Strangles cases have been attended by SAMABHAVA. 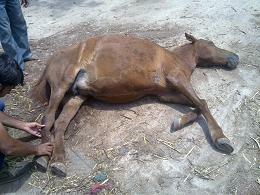 Several equines have been victims of road accidents. Which either result in minor injuries such as cuts and bruises or severe fractures, and breaking of bones which ultimately leaves them permanently disabled or leads to a slow and painful death. In situations where there is no hope for survival, such as a compound fracture; the animal has to be euthanized. 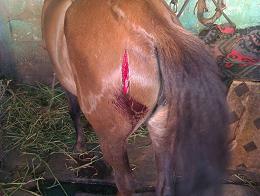 Equine medicine is extremely underdeveloped in India. There are no facilities for major surgeries and limb reconstruction. This leaves us in a very perplexed state when we come across serious, life-threatening accident cases. 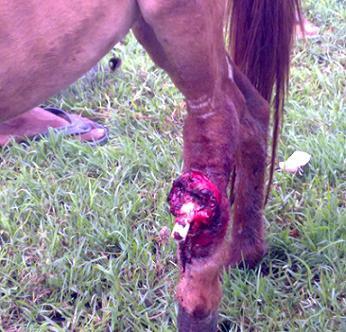 There are other injuries equines encounter due cruelty and ill-treatment by humans. SAMABHAVA has treated and followed up on several such cases.